I am not what you would call the world’s most organized person. While thankfully hygiene standards don’t usually drop below a certain level in our household, mess is another matter entirely; at times I’ve wondered if I emit some kind of magnetic attraction for chaos as no matter how hard I try to keep things neat, tidy and in their rightful places, they never seem to stay that way. One of the prime examples of this (besides my half of the closet, and believe me, you do not want to go there) is my to-cook list for this very blog – or as I should more accurately say, my to-cook lists. You see, once upon a time, back when this site was young and I knew that much of its continued success would depend on my being methodical and disciplined about coming up with new content, I bought myself a little notebook. In this notebook I intended to keep one centralized, comprehensive list of things I wanted to cook, including the random ideas that occasionally assault me as well as the many tempting recipes I run across in cookbooks and magazines, which I would be able to refer to whenever I needed inspiration. In addition, having a list would allow me to phase out my far less efficient system of flagging finds with bits of post-it notes or folding down page corners – both of which tended to result in more forgotten recipes than culinary epiphanies. It actually went very well for a few months, and I dutifully documented every appetizing inspiration and tempting recipe I ran across, and even managed to make a few of them while I was at it. But as I might have predicted, my enthusiasm for this new system eventually began to wane; without even realizing it I started consulting my notebook less and less, and eventually it got itself placed in some pile of stuff that my dear chaos-phobic (i.e. German) husband in one of his I-can’t-take-this-mess-anymore fits relocated to some dark and invisible corner of our apartment. Although I didn’t really miss the notebook itself, the problem was that I had gotten used to jotting down recipe references instead of marking their location at the source, and thus when the notebook disappeared I simply carried on writing those little notes on whatever paper I could find. Soon our apartment, in addition to drowning in cookbooks and food magazines, was awash with little bits of paper – backs of envelopes, torn corners of bank statements, margins of old shopping lists – enthusiastically reminding me to make Azeri Meatball Stew or some great new variation on eggplant parmesan. I even made a stab at locating the notebook when I realized what a mess I was making, but that failed – as did my half-hearted attempt to collect all those scraps of paper into a central scrap location, since I could never remember where it was. The end result of all this chaos, of course, was that unless a recipe was so phenomenally tempting and immediately do-able, chances are it would be noted, lost and forgotten long before it had a fighting chance to actually be made. But as luck would have it, a couple of weeks ago I was rifling through a large stack of magazines and old mail in our living room – something I swear I’d done a hundred times already – looking for a misplaced utility bill, when something familiar slipped out: my old notebook. Clutching it like a long-lost friend, I settled into the sofa and cracked it open, curious to see what exactly I had intended to cook a year or so ago. Inside was a long list of dishes, some of which I couldn’t for the life of me understand what had attracted me but most of which still sounded pretty good. A few even caused me to slap my forehead in disbelief – how could I have forgotten that one? The one that caused me the most head-slapping, however, was the entry at the very top of the list. This was something I’d been intending to make for so long that it was likely the very thing that compelled me to start keeping a list in the first place, in hopes that doing so would finally motivate me to cross it off. Unlike the rest of the list, this entry had no cookbook reference or involved description, just three simple words: pão de queijo. That was all the reminder I needed. Pão de queijo literally translates from Portuguese as ‘cheese bread’, and though that’s essentially what these puffy little rolls are, the name only tells half the story. The first thing to know about pão de queijo is that the relationship Brazilians have with it borders on obsessive. In researching recipes I stumbled upon one by Valentina (also the author of Trembom), and in the headnotes she relates how she once joined a Brazilian online forum called ‘I’m crazy about pão de queijo’ which was dedicated to nothing else but discussing the merits of, and sharing recipes for, versions of this tasty snack. At the time she joined the forum had more than 200,000 members(!). The second thing to know is that these little breads are fundamentally different from the majority of cheese-bready things around the world in that they are naturally and completely gluten-free. While they seem to be cousins to the French gougères in terms of technique and appearance, they’re made entirely with tapioca starch (the fine, white powder extracted from cassava roots), which gives them a texture quite unlike anything else. Their transformation is actually quite miraculous to watch: they go into a hot oven as lumpy, ragged little mounds with the consistency of spent chewing gum and emerge light as air, crusty around the edges and possessing a wonderful, toothsome chew. Brazilians, it seems, love to eat them for breakfast with coffee, though I’m just as inclined to nibble them with a pre-dinner drink, and they’d also be a great accompaniment to a hearty soup or stew, or could even be fancied up as party food with a stuffing of some kind. Brazilians of the world, you are really onto a good thing here – though I’m sure you don’t need me telling you that this is one for the permanent recipe file. And speaking of that file – you know, that centralized, organized place I keep track of all the recipes I intend to make again – well, it’s about time I put one together, don’t you think? I’ll just have to put it on my list. There seems to be widespread consensus that these are quite tricky to make, but I didn’t find this to be the case. One thing I would recommend is to measure the tapioca starch by weight if you can, which is infinitely more reliable than by volume. If you do measure by volume, note that I use the lightly-aerate-then-scoop-and-level method. In the recipe I’ve given some clues as to the texture you’re aiming for in the dough – the important thing to note is that it should not actually be firm enough to make balls, but rather soft, misshapen little mounds. If you’re worried, you can always test-bake a couple to see if they puff up like they should. As for the tapioca starch/flour, you should be able to locate some in an Asian or other ethnic market (where you might find it under the names yuca, manioc, cassava or polvilho azedo/doce, any one of which will fit the bill), or any place that stocks gluten-free baking supplies. In the bowl of your heavy-duty stand mixer* combine the salt and tapioca starch. In a saucepan combine the milk and butter and bring to a boil, stirring occasionally to prevent scorching. Fit your mixer with the paddle attachment, turn on medium-low, and begin drizzling in the hot milk mixture. At first it will all clump up, but keep drizzling in, stopping and scraping down the bowl and paddle as necessary, until it comes together and forms a smooth, thick, gluey dough. Beat for a minute or two, then turn the mixer off, cover the bowl with a cloth and let rest for 15 minutes, or until just warm to the touch. Preheat the oven to 425F/210C. When the dough has cooled down a bit, turn the mixer to medium speed and add the eggs one by one. When they are completely incorporated add the cheese and mix for another minute. The dough should have a sticky, stretchy consistency somewhat like spent chewing gum (but a little softer). It shouldn’t be firm enough to roll into balls, but it should be firm enough to hold its shape on a spoon. Add a bit more starch or a splash more milk if needed. Line two large baking sheets with parchment paper. Using a well-greased spoon (or a couple of spoons, or a spoon and your hands – whatever works), drop mounds of dough about the size of unshelled walnuts onto the sheets, spacing them at least an inch (2.5cm) apart. Don’t worry if they are not perfectly shaped, or if the surfaces are not smooth – in the heat of the oven the irregularities will melt away. Bake them for about 20-25 minutes, rotating the baking sheets halfway, until they’ve puffed up nicely and are golden brown in spots. Remove immediately to cooling racks and allow them to cool slightly before eating. The recipes say to enjoy them warm, but I liked them at room temperature as well – the texture is slightly different but still very good. I blame it on creativeness, being inquistive, a touch of AADD (due to the afore mentioned)! Can you obsess over orderliness and still paint, cook, read, parent, love, enjoy the outdoors, research your latest interest, work? I can’t quite seem to, so I’ve promised myself to keep my surroundings clean enough to be healthy and organized enough to stay somewhat sane…besides it’s kind of fun unearthing a forgotten treasure! Living with a coeliac parent who doesn’t like gluten-free wheat products, I’m always interested to find gf recipes such as the Christmas pudding my mum made this year. I shall look out for this bread and maybe try cooking some. Great photo by the way! This sounds utterly delicious, and completely do-able. Just adding it to my "blog book", which like yours, is filled with lists! Another fascinating post, and a recipe I’m dying to make! Ever since a chef-friend moved to Brazil in the fall, I’ve been collecting Brazilian recipes — to impress him when he visits, or if I’m lucky enough to visit him there! Thanks. Thanks so much for this recipe. A local company makes these but they are super expensive. I’ll enjoy trying to make my own. Cheers! Are you telepathic? Not only have you described (in detail) my congenital messiness, but also my little ideas notebook, the papers I have in all my pockets, handbags, etc… And to top it all off, a gluten-free recipe, so I can finally bake something again for the 1st time since being diagnosed with gluten intolerance 8 months ago. GF bread is more a necessity than a pleasure, so to stumble upon something good enough for gluten-eaters was a real Monday Bonus. Thank you! You will never know just how grateful I am for this post! Like you, I’ve had pao de queijo on my must-try-to-make list for years! Three and a half years to be precise. I don’t know why I keep postponing, but I think it has a lot to do with the fear of failure. But no, I can’t let that stop me right? Actually it might have been a blessing I waited this long. I think subconsciously I was waiting for this post! 🙂 So thank you for your post, I’m very much inspired to try this out for myself finally. Hi, Melissa,As a Brazilian and a friend of Valentina’s, I have to say I love your post!! :)Pão de queijo is something people go crazy over here, you’re right. People will have pão de queijo and black coffee in the morning or as an afternoon snack. My grandmother makes them very often, once or twice a week – she freezes them so whenever someone feels like having pão de queijo she just pops them in the oven and there you go: hot, delicious pão de queijo fresh from the oven! 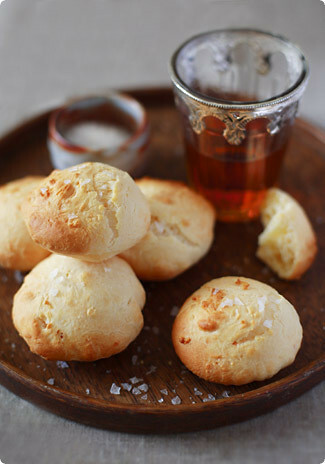 Melissa, how lovely to read about pão de queijo in your blog. Your way with words and the power of your narrative are just fantastic. Since I posted the recipe you have read I have become familiar – through the endlesse comunity of fellow brazilians, of a variation that uses mashed potato.It has become my favorite,It becomes firm, like playdough, and can be frozen. Whenever you have a guest, or a craving, just take them out of the freezer and bake them. Let me know if you would like this recipe. It requires hand-work, but it is not as messy as many other recipes. My boyfriend is a scot and ‘demands’ pao de queijo weekly. first thing on my list: remember list…then i leave without it. grrr. look how many of us relate Melissa. it’s got to be a human default system (excepting your husband of course). The week I was thinking about starting a blog I sat and wrote down a list of topics I’d like to tackle…which convinced me I had enough to say…so I started my blog (which if you’re over 40 is quite intimidating, as you have to look up the word blog before you begin) and never touched the story list again…unbelievable. But living with a newbie gluten free spouse means I’m particlularly grateful you re-excavated the notebook…I guess I’ll dig around on my hard drive an see what’s left on my list…happy cooking. Lots of chortling going on here – belly LOL’s over your post. When you re-read your notebook and wondered why-in-the-world you thought something was even on the list, I saw my reflection. I subscribe to a myriad of cooking magazines. Over the years I have used a number of techniques for saving recipes – (1) photocopying the recipes so you can leave the magazine intact; (2) sticking little bits of paper, like bookmarks, into the pages; (3) storing the magazines by year, which really didn’t work since I could never find anything afterwards; (4) turning down the corner of the page to remind me to look there, which is similar to #2 above except doesn’t look so messy; and (5) my current method – I clip out the recipes as I read the magazine and toss the tattered magazine away once it’s read. Anyway, sometimes I unearth an older magazine with bookmarks, turned corners, etc. and look at the page(s) I’ve bookmarked. I scan both pages . . . hmmm . . . what did appeal to me here? I cannot imagine. Sometimes I even circled the recipe in ink lest I forget. I’ve had many a LOL moment wondering where my mind was when I identified some recipe. I could barely read the post because I am enamored with that gorgeous glass in the photograph. It is so beautiful! Tossing cooking magazines away??!!! impossible, I keep each magazine, recipe, post it , note, 15 years old handwritten notebook… "just in case" =)Oh, and these pao de queijo are very similar to our Argentine "chipás", typical of the north provinces, so as usual the same recipe takes different names according to the place. Those are stunning. I love bread. I love cheese. I love cheese bread. Guess I’ll have to give these a try. Now where’s my list…. ? I’m using two notebooks and an electronic list plus a folder full of magazine cuttings – while reading your post I had sort of an epiphany where this will be getting me…Awesome post as always, Melissa, not to mention the gorgeous picture! But how shall I ever find the time to reproduce all your creations that are on my list(s)…? Yummy!!! I am crazy about pao de queijo! Believe me, every Brazilian is, and what a nice surprise to visit you for the first time and find this recipe! thank you! pão de queijo is one of my all-time favorite things to munch on! i have only ever baked it with a ready-to-bake mix brought over from brazil by visiting relatives.. and have meant to bake them from scratch for the longest time! what a delicious reminder!when visiting cousins in brazil, it was not uncommon for us to pop down to the neighborhood bakery early in the morning to pick a fresh bag of pão de queijo up to add to the spread on the breakfast table. There is a commercially prepared bread that is gluten-free that sounds like what you’ve made. It’s called Chebe bread. But to have the recipe and be able to make it homemade – AH, that’s what I like. Thank you so much. I will be trying these tonite! I have had these once in my life, over 10 years ago, made by the wife of a brazilian colleague. I still remember them as one of the perfect bites of food I have had in my life. When I saw your recipe I knew I had to try.I failed utterly. Instead of the light yet chewy puffs of cheesy goodness, mine were hockey pucks. Dried out with a thick hard casing and inedible. I don’t know if I screwed up the ratios utterly (I fear my dough was too wet), or if my oven was at fault (I think it runs high), but the last time I screwed up this badly I was trying to make quenelles. My poor in-laws.Any advice would be much appreciated, although I want to calrify that I know the fault was with me, not with your recipe. Your picture looks just like the cheesy goodness I remember. Charlotte – Yikes! I’m so sorry these didn’t turn out for you. Unfortunately I’m still far from a pao de queijo expert myself, so I don’t have a lot of ideas as to what might have gone wrong. Did you mix them by hand or in a stand mixer? Did they hold a mounded shape on the baking sheet before going into the oven, or did they collapse into a puddle? I suspect your oven running hot is not the reason they failed, as I’ve seen some recipes call for a temperature even higher than this. It might indeed be that the dough was too wet, in which case you could try again, test baking a couple at a time and gradually increasing the starch each time. Maybe different brands of tapioca starch/flour absorb liquids differently? In any case, if you do give these another try and manage to make them work, please do let me know how you did it! how fantastic, I just had some of these for the first time over the weekend! I can’t wait to try them. Is there any better combo than bread/pasta, cheese and butter? I dare say not. I think I screwed up in 2 different ways. My dough puddled (But I was afraid of adding more tapioca – I measured by volume. Yeah.) and my oven was definitely too hot. But I will persevere, because dammit, I remember that sweet, cheesy, chewyness (is that even a word?) and I will succeed!Thank you very much for your encouragement. It was most appreciated. I’ve been a reader for over a year now, and I’m pretty shy about commenting…I had to come out of my shell for this one. Excellent blog by the way, I don’t know which I love more your writing style, or your photography :)So, back on topic. My closest friend is Brazilian, and he raves on and on about these things. We found some frozen ones, and they were fantastic, but to me, anything worth eating is worth making from scratch. I’ve been looking high and low for a good, tried and approved recipe for these little badboys, from scratch. Even his mama makes them from a mix. I cannot WAIT to make these, thank you so much! You helped make a homesick Brazilian boy very happy, I’m sure. Lisa – Why thank you, and I’m always glad to have inspired a delurking! 🙂 I’ve heard that mixes are quite commonly used in Brazil, but never having tried them myself I have no idea how they compare to the ‘from scratch’ article. You’ll just have to report back!Steffi – I’m sorry to say that the tapioca starch is quite integral to this recipe — without it these rolls would be something completely different! I used to buy tapioca starch in Germany in Asian shops, under the name ‘Tapiokamehl’. Otherwise you might try your local Reformhaus? Oh my goodness. It’s too long since I’ve stopped by. I love these things, having only ever tasted them in Brazilian restaurants. Now, thanks to you, I can actually make my own — as soon as I source the tapioca flour. Shouldn’t be too hard in my multi-ethnic neighborhood. Mmmmm. I can hardly wait. Breakfast next weekend is going to be GOOD. Another one who totally relates to the lists and paper scraps all over the house!! Oh, aaand the tidy husband!!P.S. I’m just loving your blog!!! I think the pao de queijo can get tough (as reported by Charlotte) if you overmix the dough. One of the packaged recipes I use specifically tells you to mix with a fork exactly 10 times (funny but true). As a brazilian I must say: Yes, we are crazy about pão de queijo! There are so many variations of this recipe … but in the end, it's all hapiness :)Your blog is amazing! Thanks for sharing so many good things!